Here are some of our favorite yoga poses. Try them with your child! Get down on your hands and knees, and spread your fingers wide like they are cat paws. Round your back upwards as you exhale and tuck your chin into your chest, your tailbone under, and look towards your belly button. Really stretch your spine and "meow" like a cat! Now inhale, arching your back, reaching your stomach towards the floor. Lift your chin and chest towards the sky. You can "moo" in this stretch! Move back into Cat Pose and "meow" even louder! Repeat about five times back and forth. This vinyasa is great for digestion and for strengthening the spine. Start with your belly on your yoga-surfboard mat and begin to paddle out into the ocean. When you see a wave, jump up into Warrior 2 (with arms out to a "t"). Bend your front knee to really ride that wave! Imagine the wind blowing through your hair as you rip through the ocean! Reach your front arm forwards. Then your back arm backwards. Fold forward and look underneath your surfer legs. Woo-hoo! Cartwheel your arms back down to your surfboard and bring your belly back down so you can paddle out and catch another wave. When you see one, jump back up into Warrior 2, but this time, bring your other leg to the front of your surfboard. Ride that wave! Weeeeeee! Repeat as desired. When you're ready, slowly paddle back to shore. Rest on your back and let yourself dry off in the sun. Ahhhh. This fun, moving pose strengthens the legs, stretches the spine, and gets your heart pumping! It's also so much fun! Start in Plank Pose (like a push up with arms straight). Slowly roll your body onto your left side, gently stacking your right foot on top of your left, and place your right hand at your right hip. Now lift your right hip up so that your body forms a diagonal line from your head to your feet. Take a few deep breaths. When you feel balanced, raise your right arm to the sky. Imagine all the colors of the rainbow shooting out from your fingertips! Come down slowly, rest, and repeat on the other side. This challenging pose strengthens the arms, legs, back and belly, and teaches balance and concentration. Dressing in rainbow clothing is optional. Stand tall with your feet together. Stretch your arms high over your head and make a "v". Slowly start to lift your right leg up, so that the sole of your foot meets the inner thigh of your left leg. Spread your branch-like fingers towards the sky. Imagine yourself to be a tall tree high on a mountaintop and stretch even higher. Try to balance for five breaths. Slowly release back to standing. Repeat on the opposite side. This pose helps to improve balance and concentration. To come out of the pose, the parent should sit up slowly so that the child eased back onto their feet. 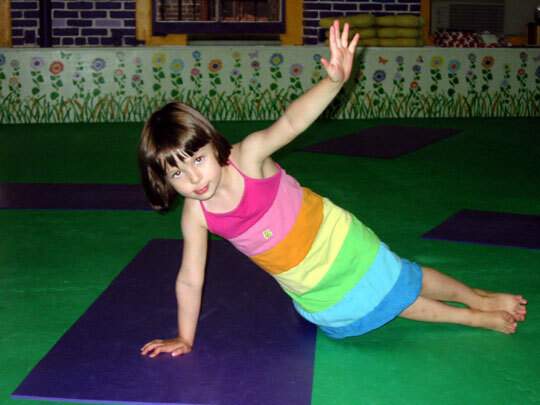 Both parent and child should rest in mouse or child pose for a few more breaths.